Generate a GraphQL schema from the concise type definition language. The graphql-tools package allows you to create a GraphQL.js GraphQLSchema instance from GraphQL schema language using the function makeExecutableSchema. See the complete live example in Apollo Launchpad. This example has the entire type definition in one string and all resolvers in one object, but you can combine types and resolvers from multiple files, as documented in the modularizing the schema section below. The official documentation on graphql.org now has a section about GraphQL schemas which explains all of the different schema features and how to use them with the schema language. 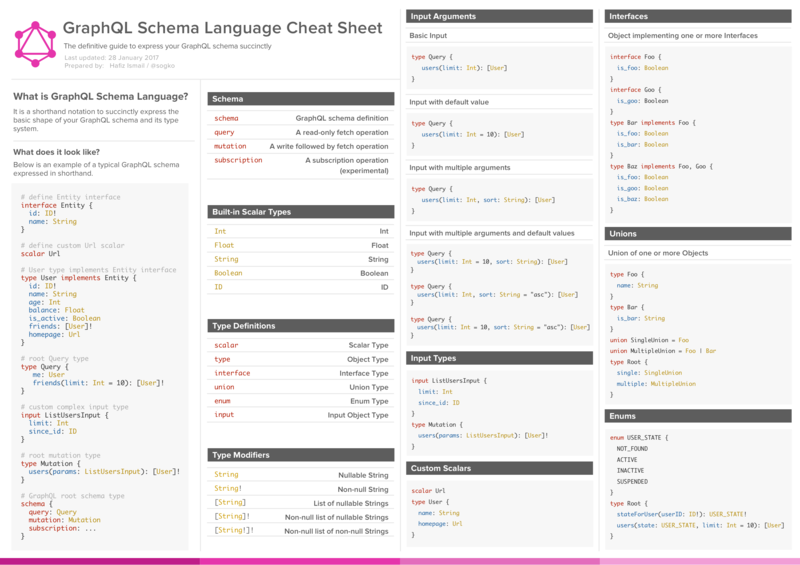 This GraphQL schema language cheat sheet by Hafiz Ismail is an excellent reference for all the features of the GraphQL schema language. makeExecutableSchema takes a single argument: an object of options. Only the typeDefs option is required. typeDefs is a required argument and should be an GraphQL schema language string or array of GraphQL schema language strings or a function that takes no arguments and returns an array of GraphQL schema language strings. The order of the strings in the array is not important, but it must include a schema definition. resolvers is an optional argument (empty object by default) and should be an object that follows the pattern explained in article on resolvers. parseOptions is an optional argument which allows customization of parse when specifying typeDefs as a string. allowUndefinedInResolve is an optional argument, which is true by default. When set to false, causes your resolve functions to throw errors if they return undefined, which can help make debugging easier. requireResolversForArgs will cause makeExecutableSchema to throw an error if no resolve function is defined for a field that has arguments. requireResolversForNonScalar will cause makeExecutableSchema to throw an error if a non-scalar field has no resolver defined. Setting this to true can be helpful in catching errors, but defaults to false to avoid confusing behavior for those coming from other GraphQL libraries. requireResolversForAllFields asserts that all fields have a valid resolve function. requireResolversForResolveType will require a resolveType() method for Interface and Union types. This can be passed in with the field resolvers as __resolveType(). False to disable the warning. allowResolversNotInSchema turns off the functionality which throws errors when resolvers are found which are not present in the schema. Defaults to false, to help catch common errors. inheritResolversFromInterfaces GraphQL Objects that implement interfaces will inherit missing resolvers from their interface types defined in the resolvers object.